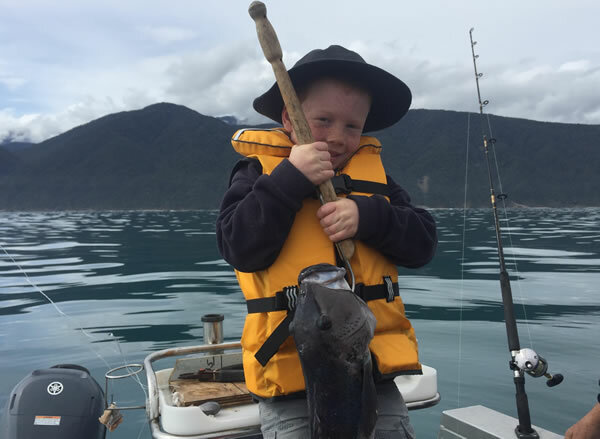 Our goal as guardians is to ensure that fishing in Fiordland can be enjoyed by many generations to come. All fishers share a responsibility for conserving the area’s valuable fisheries and protecting its unique marine environment. We encourage you to fish for a feed, not for the freezer. Take only what you need for a fresh meal for yourself and your family. Before you leave home, make sure you know where and when you can fish, what methods are permitted and how to clean your gear before you arrive. Check the rules before you start fishing. See Fisheries New Zealand website or download the NZ Fishing Rules app. Once installed, the app will work without an internet connection. See our Guide to Fiordland (page 59) for more information and rules for fishing in Fiordland. Fish in the outer fiords and beyond the coast whenever you can. These areas have more nutrients and therefore more fish. Avoid anchoring when you’re fishing and spread out your fishing effort. Secure your gear in bad weather so you don’t lose it or foul your propeller. Use the right method to catch the fish you are targeting. Carefully return any undersized, unlawful or unwanted fish straight away. Don’t take more bait fish than you will use – and make sure they are legal size. Treat what you catch humanely. There are 10 marine reserves in Fiordland. Marine reserves are special places that protect the species and habitats within them and ensure the marine biodiversity is maintained in a healthy state. No fishing of any kind is allowed in a marine reserve. No fish feeding is permitted in a marine reserve. See DOC website for maps and boundary information. Milford Sound/Piopiotahi: closed to blue cod fishing. Doubtful Sound/Patea, Thompson Sound and Bradshaw Sound: daily take and possession limit is one blue cod per person with no accumulation. Fisheries New Zealand (Ministry for Primary Industries) is developing a National Blue Cod Strategy. See Fisheries New Zealand website for the latest updates and for background information. Rock lobster potting is not permitted in marine reserves, some no-anchoring areas (china shops) or in the Pendulo Reach internal waters of Doubtful Sound/Patea. No commercial fishing is permitted in the internal waters of Fiordland. This applies to 15 named fiords. The boundary lines for the internal waters are not marked with physical markers, but the GPS coordinates are available from the Fisheries New Zealand website and are published in our Guide to Fiordland (pages 84–139). See Fisheries New Zealand website for commercial fishing information. Te Tapuwae o Hua (Long Sound) Marine Reserve. These pots must not be capable of catching rock lobster. Read our latest newsletter or sign up to receive them regularly through the year. Copyright © 2018 Fiordland Marine Guardians. Copyright © 2018 Fiordland Marine Guardians. All rights reserved.